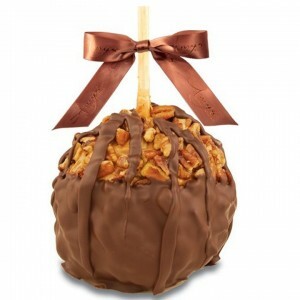 Welcome Fall with a Decadent Delight: Gourmet Caramel Apples! Just as is surely the case for many of you, fall is my favorite season. I love the ‘jeans and a jacket’ weather, the beauty of nature in evolution, Thanksgiving and Halloween, and so much more. But the one thing that really sets it apart for me is the speed of the season. Yep, you read that correctly, the speed! In my experience, summer tends to move very quickly. There are lots of places to go, people to see, and things to do. It is fun for sure, but very busy. And winter? Winter is just the opposite; winter moves very slowly. With snow and ice and early sunsets, it sometimes seems as though we’ll never get where we’re going or see the light of day again! But spring and fall? Well, they move just right! Fast enough that you’re definitely doing and seeing, but not so fast that you can’t take it all in and appreciate it. In spring, those things you’re taking in include the blooming flowers and warm breezes. 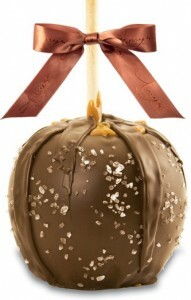 And in fall, those things include long walks and gourmet caramel apples! You don’t have to fight with the sweltering summer sun to keep your apple from melting! In warm and hot weather, we often crave ‘lighter’ treats, like ice pops and melon slices. But in the fall and winter, our appetites for richer snacks are awakened, and our taste buds jump for joy over chocolates, caramels, pies and the like. These snacks might be too heavy in the heat, but they’re fall fabulous!